La Loutre. Lutra lutra. Eurasian Otter. Almost everybody knows something about otters and has some knowledge of what they are, that they live in water and eat fish, but most people have never seen one in the wild or at best only once or twice. At the beginning of the 20th century the otter was present and relatively abundant in just about every part of Europe, then in the 1930’s its population started to decline, in the 1950’s – 1960’s the decline had become quite rapid having disappeared completely from 60 departments in France. 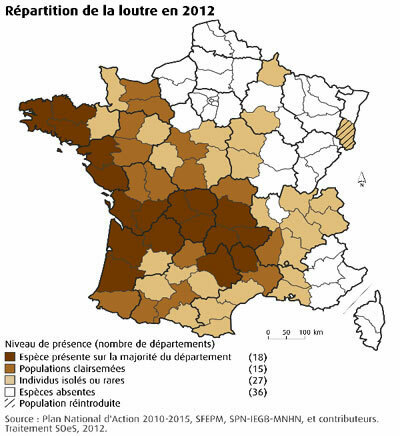 The population continued to weaken into the 1980’s until eventually it only remained on the Atlantic coast and in the Massif Central. Since the 1990's the situation has improved with gradual re colonisation in many areas. The situation in the rest of Europe has followed a similar pattern with probable near extinction in Holland and Switzerland, Italy, Belgium and Luxemburg. The U.K has seen some encouraging signs of improvement due to conservation initiatives and cleaner rivers. 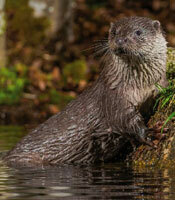 Traditionally the otter has been a victim of hunting and trapping, hopefully this practice has almost ceased! Anyone known to be harming otters should be immediately reported to the Gendarmerie. Pollution is a major threat to otters the main dangers being organochlorines dieldrin, polychlorinated biphenyls and mercury (industrial pollution). Coastal populations are at risk from oil spills (accidents and flushing of ships tanks). Organic pollution from nitrates and slurry (agricultural pollution). 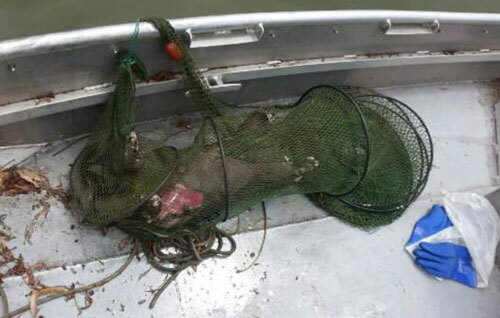 Strangulation and drowning both in fishing nets and in traps designed to kill other species. 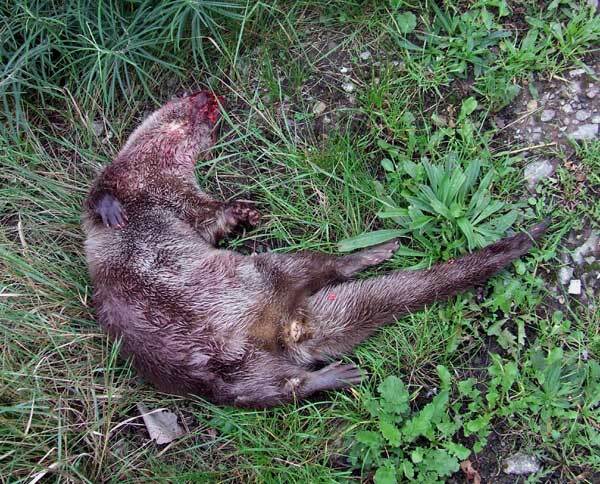 Road building is a major problem; many otters are killed by traffic when new roads are built in their territory (77% of known deaths in the Central West of France). Photo. Dead otter, road kill. Jo Sayers. Habitat loss from drainage and drying up of large ponds / lakes and waterways, river bank "improvements" and farming right up to the edge of rivers etc. bank side vegetation being very important. Poisoning may also be a factor. That’s the bad news, so what about otters and what do they need? In general, other than when mating for a period of two or three weeks, the otter is a solitary animal inhabiting rivers, streams, highland and lowland lakes and coastal areas, it is adaptable to salt water but this is usually correlated to the presence of freshwater . It has a requirement for dense bank side vegetation with the presence of holes in the river bank, cavities in the tree roots, piles of rocks and wood debris. An otter will often have a territory of 20 to 30 kilometres and not without good reason as the diet consists principally of fish; if it stayed in one place it would soon exhaust the food supply. 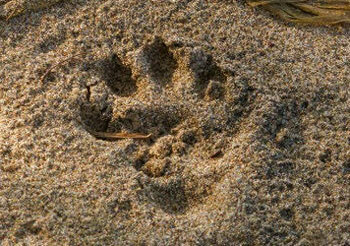 It also preys on frogs, eels, crustaceans, small mammals, birds and insects, its diet varying with the seasons. Mating takes place at any time of the year and this is where the structure of the bank side has great importance for constructing a Holt. The young are born, usually 2 or 3, after a gestation period of about 60 days; they are born with closed eyes which will not open for about 5 weeks, they develop quite slowly being feed with the mothers’ milk. After about 7 weeks they will start to venture out a little and take solid food provided by the mother who will continue to milk feed up to 14 weeks. At this point they don’t know how to swim and often need to be dragged into the water by their mother, where they soon catch on and are quickly capturing their own food although they will remain with her for the next 12 to 14 months. Incidentally, an otter swims with its nose above the water, only staying under water for about 20 or 30 seconds when hunting. Sexual maturity is reached between 2 and 3 years for males and between 3 and 4 years for females and although an otter can live for up to 16 years in captivity, its life in the wild rarely exceeds 5 years. 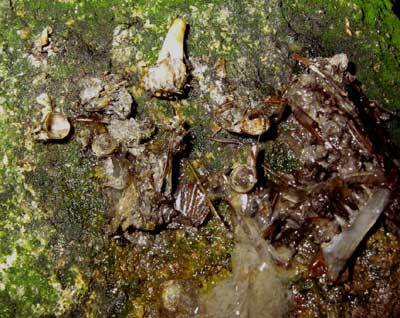 Otter spraint, clearly visible are fish bones and scales. Is the tide turning it favour of the otter? Yes. Thanks to cleaner rivers, greater understanding from the angling community and commercial fish breeders they are recolonising their old territories and increasing their range year on year but there is no room for complacency. Finally its Status: Fully protected species. EU Habitats Directive annexes 2 & 4 ; Berne Convention annexe 2 ; Washington Convention annexe 1 ; Protected at the National level in France art.1.modified. 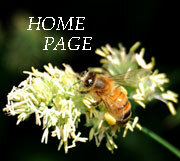 Listed Globally as Near Threatened with IUCN. Red List. (In danger France IUCN).